Creative Coding Conversations - Nettrice Gaskins — Wonderful Idea Co. This summer, we’re interested in diving into creative coding — a playful, collaborative, and open-ended approach to exploring and creating with digital tools. With so much emphasis on coding and computer science, we wanted to explore what these ideas look like an a creative context. What does it mean to play, experiment, and create with code? How might educators, facilitators, and artists bring these ideas into their practice? We’ll be hosting a professional development workshop at the Brightworks Annex in San Francisco in August to figure out these ideas together. In anticipation of the workshop, we’ve been asking friends, mentors, and inspirational thinkers who work with creative coding to share their thoughts, as well as an image of what creative coding means to them. We’re excited to share their reflections and learn more with our Creative Coding PD participants, and to continue the conversation beyond August! NG: I am an artist who also teaches, writes, "fabs" or makes and does other things. I've taught multimedia, computational media, visual art and even Advanced Placement Computer Science Principles with high school students who majored in the arts. My late mother was a computer programmer/analyst and I grew up around her working with FORTRAN and COBOL. I wanted to be an artist and didn't think anything she did was relevant to my goal. That is until I was persuaded to take computer graphics in high school where I majored in visual art. My high school art teacher, Mrs. Sidebottom, normally taught ceramics (and still is a ceramics artist) but she decided that we needed to learn something new. Her lab consisted of Amiga computers and Mac Color Classics. I enjoyed using Deluxe Paint or D Paint and produced a portfolio that got me into Pratt Institute in New York. I majored in Computer Graphics at Pratt, then Art and Technology at SAIC. Most recently, I received a doctorate in Digital Media from Georgia Tech. However, it all started in a high school art classroom that also served as a computer lab. Currently, my work explores machine intelligence and I collaborate with A.I. to produce images with Deep Dream. 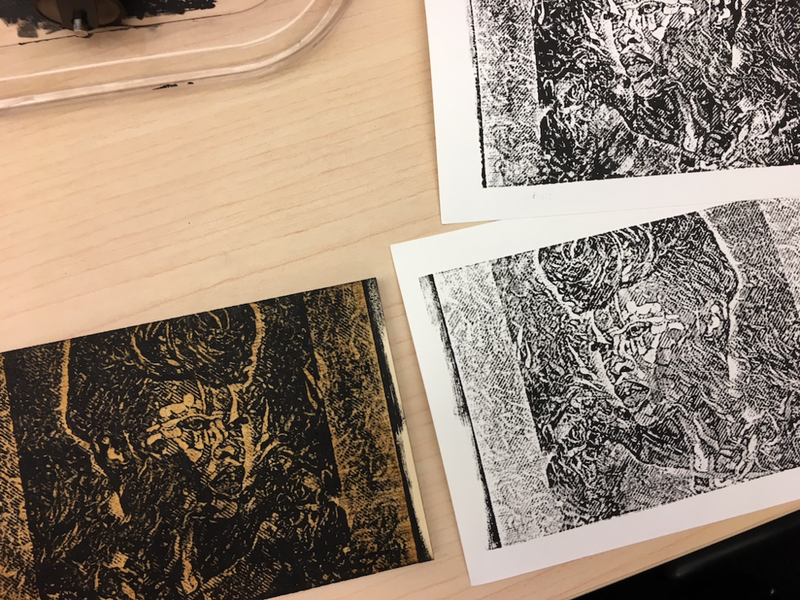 Some of the images are raster engraved on linoleum or wood using a laser cutter (for printmaking). I also use them as background images for Processing (programming language) projects, also using a Leap Motion Controller to produce graphics on top of the images. In the near future, I will put it all together -- Deep Dream, Processing (gestured based graphics from code), digital fabrication, and printmaking. What does creative coding mean to you? NG: John Maeda (former MIT Media Lab director) emphasized the importance of designers understanding the computer as a medium, not just a tool. For me, design is secondary or maybe even tertiary to aesthetics and culture. Creative coding means we can be flexible with the way the computer is used to make art. For example, with glitch art, artists make use of digital or analog errors for aesthetic purposes by either corrupting digital data or physically manipulating electronic devices. Hip-hop is part of a historical continuum of urban engagement with space and time. Creative coding links these seemingly practices and we can see this in architectural designs and contemporary artworks including performances. The flexibility in coding means that artists can use code to generate images or patterns that can be used for many different kinds of projects. My recent projects involve creative coding in some way, from using OpenGL Shading Language (GLSL) based on the C programming to using Processing to connect to a Leap Motion controller in order to generate motion-based work. For artists like me, coding is an evolving artistic language that allows people to interact with the art. We can use code with 3D printing or laser cutting to create physical objects. Crowd-sourced research projects and platforms explore the use of machine learning in artificial intelligence (AI) to create different forms of art, including music and visuals. What does creative coding look like in practice? NG: Pattern recognition enables us to connect what we do in the world with what we see on a computer screen through coding. The basic process for making computational forms is a simple pattern or algorithm. Computationally, a hip-hop cypher or circle is an algorithm and what happens in the circle is similar to the a conventional cipher that is combination or interweaving of letters or numeric characters. Artist Doze Green is a former B-boy who talks about how the letter forms in graffiti inspire the poses breakdancers make in the cypher. There is a relationship between the letters or characters and the sequences that are created. This, to me, is how creative coding works. Practitioners (coders) create the instructions (algorithms) for the forms and what we see in the circle (screen) is the output. Like computer scientists, artists make use of algorithms and use a variety of techniques to generate patterns or designs. We can see the beautiful patterns that evolve from a simple shape that is repeated using a piece of code (loop, conditional). What would you tell someone who is just starting with creative coding? NG: Just make stuff; do stuff. Mess with the code. When I taught AP Computer Science Principles to high school art students, I usually talked about the similarities between art techniques and computation. We wrote cooking recipes to understand how algorithms worked and looked at poetry, rap lyrics, or speeches such as Sojourner Truth's "Ain't I a Woman" to understand how conditionals work. My goal was making new or foreign information relevant through things students already did through art and other subject areas. As an artist, I often think about what I want the code to do and set about finding examples that are close to what I imagine. Then, I make changes in the existing code.